Today was an extremely hot and sweltering day here. It's pretty obvious that summer has arrived, and with a vengeance, at that! As I was driving home from work, I was thinking about what to fix for dinner. I was in the mood for burgers but thought it might be too hot for hubby to stand outside and grill them in this nasty heat since we haven't acclimated to the abrupt hot temps yet. So, I decided to go ahead and make burgers, but cook them inside instead. I was in the mood for a super delicious burger. I thought about making traditional bacon cheeseburgers...you know, plain burgers topped with a slice of cheese and a few strips of bacon. Instead, I decided to make a "package deal" burger. I decided to mix everything all up together. The result was absolutely AMAZING...both the flavor and the moistness of these burgers. I actually prefer them this way to the traditional version with the bacon and cheese on top. I whipped up a batch of my delicious Sesame Seed Sandwich Buns and a batch of my Easy Coleslaw and then began working on the burgers while the buns were in the oven. I cooked 6 strips of bacon in a large nonstick skillet until crisp and reserved the bacon drippings to cook the burgers in. I simply crumbled up the crisp bacon and then combined all the flavors of what I think make the perfect bacon cheeseburger; ground beef, crumbled bacon, a squirt of ketchup, a squirt of mustard, sliced green onions, extra sharp shredded cheddar cheese, and freshly ground black pepper. Then, to push it over the edge, I cooked the burgers in the leftover bacon drippings (talk about FLAVOR). 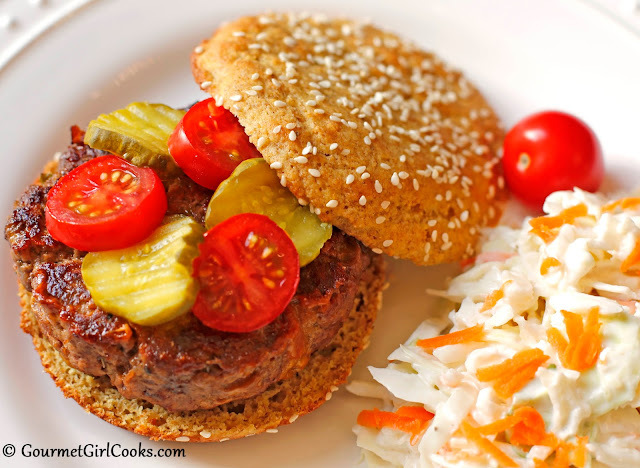 I served these moist and flavorful burgers on a sesame seed bun topped with sliced tomatoes and pickles. These were honestly the best Bacon Cheddar Burgers ever! I snapped a few photos below as well as included my easy peasy recipe. Enjoy! In a large bowl, mix together all ingredients, just until combined. 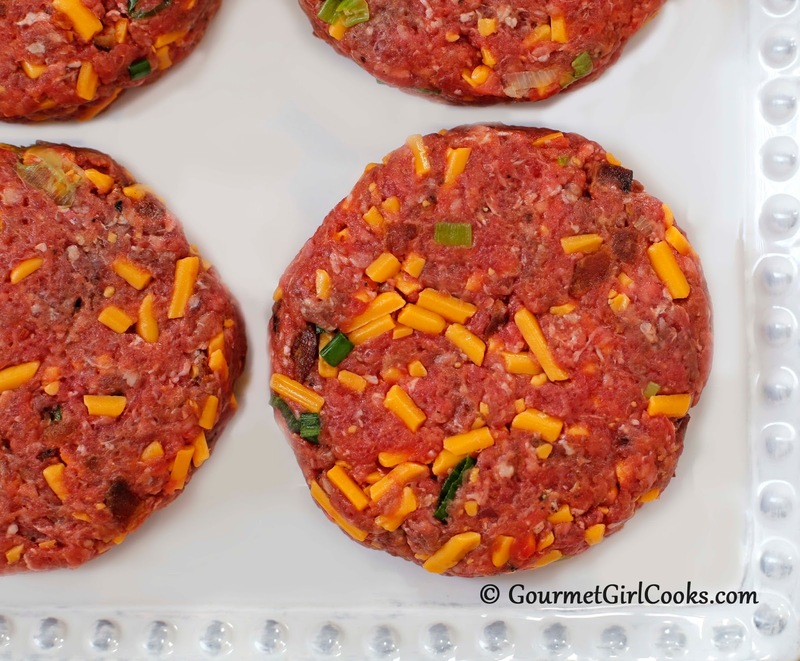 Divide meat mixture into 4 equal sized pieces and shape into patties, about 1-inch thick. Heat reserved bacon drippings (or olive oil) in a large 12-inch nonstick skillet over medium high heat; add burger patties. Cook approximately 6 minutes per side, or to desired doneness. Only error I see is........you did not use a CAST IRON skillet!!!!!!! Maybe Santa will bring you one! All of your recipes look mouth watering. What type of bacon do you use?